Jesus’ Transfiguration: The Context | Theopolis Institute | Bible. Liturgy. Culture. The revelation of Jesus’ glory at the transfiguration is one of the most important stories in the synoptic Gospels. At Jesus’ baptism — the inauguration of New Covenant baptism with the Holy Spirit and the paradigm for Christian baptism — God the Father spoke from heaven: “You are My Son, the beloved. With you I am well pleased.”(Mark 1:11) Then, at the transfiguration God the Father spoke from heaven a second time repeating what He said at the baptism of Jesus — “This is My Son, the beloved One, with whom I am well pleased.” (Matthew 3:17; 17:5)! He added, “Hear Him (17:5)! In this series, we hope to give the story something of its due. 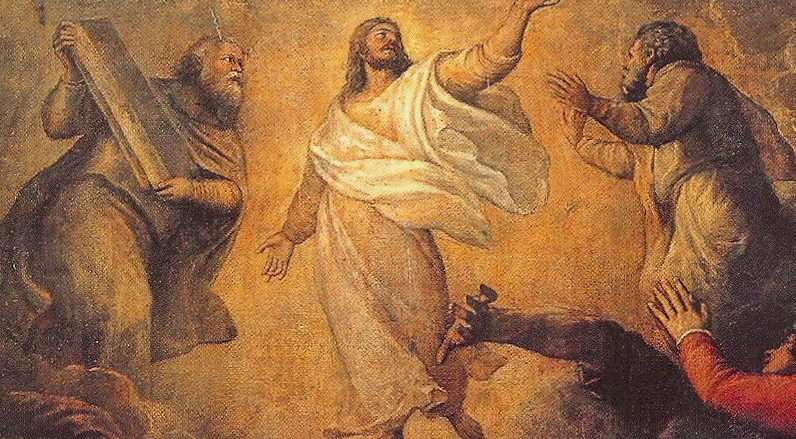 To properly appreciate the synoptic accounts of the transfiguration, it is important to consider the context, for all three synoptics record the event as part of the same series. First, Peter confesses that Jesus is the Christ (Matthew 16:13-20, Mark 8:27-30, Luke 9:18-21), which is followed by Jesus announcing that He must die on the cross and rise from the dead in three days (Matthew 16:21-26, Mark 8:31-37, Luke 9:22-25). Then, Jesus declares that some of those with Him will see the kingdom of God (Matthew 16:28, Mark 9:1, Luke 9:27). Six days later — Luke writes “about eight days later” (Luke 9:28) — Jesus takes Peter, James, and John with Him to a high mountain where He is transfigured before them, appearing with Moses and Elijah (Matthew 17:1-8, Mark 9:2-8, Luke 9:28-36). Then, in Matthew and Mark, disciples ask Jesus about Elijah. Luke does not include this part of the story. But he does include what comes next, Jesus and the disciples come down the mountain to meet a man whose son is possessed by a demon. Jesus’ disciples could not heal the boy, but Jesus does. After that, Jesus again tells his disciples that He must die and rise again on the third day. Thus, the series ends with Jesus emphasizing the cross (Matthew 17:22-23; Mark 9:30-32; Luke 9:43-45). Peter’s confession is regarded as both the climax of Jesus’ Galilean ministry and a turning point in the story of His life. But it should not be thought that Peter and the rest did not know and confess Jesus as Messiah before this point. The apostle John tells us that it was John the Baptizer who introduced Jesus to the first disciples (John 1:35-37), and it is evident that they already understood who Jesus was, for Andrew said to his brother Simon, “We have found the Messiah” (John 1:41). Phillip says essentially the same thing to Nathaniel (John 1:45), and Nathaniel himself soon makes the same confession (John 1:49). Clearly from the very beginning, the disciples became followers of Jesus because they thought He was the Messiah — even if their notions of Messiahship were vague and immature. It is notable that in John 2, when Jesus turns water to wine at the wedding in Cana, John’s conclusion to the story is: “This, the first of his signs, Jesus did at Cana in Galilee, and manifested his glory. And his disciples believed in him” (John 2:11). Since John has just showed us a number of the disciples already confessing faith in Him as Messiah, we are surely not to understand that among them were some who first came to faith in Cana. What John is saying, in language that is typical of his Gospel, is that the disciples’ faith grew. The manifestation of Jesus’ glory at Cana resulted in faith that matured. Throughout Jesus’ ministry, the disciples’ faith was encouraged by sign miracles and tested by circumstances. Even Jesus’ teaching was sometimes a test (John 6:37-44, 50-53, 60-69). Peter’s confession, therefore, marks a climax in the sense that it demonstrated that the disciples’ faith had matured to the place that they were ready for the really difficult teaching of the cross, which immediately followed Peter’s confession. This was perhaps eight months before the crucifixion — the time to prepare the disciples for the soon-coming culmination of Jesus’ earthly work. Jesus not only said that He was going to the cross, but that they, too, would have to go in the way of the cross (Matthew 16:24; Mark 8:34; Luke 9:23). Talk of the cross and resurrection was a complete mystery to the disciples (cf. Mark 9:10). Peter even rebuked Jesus for speaking of death (Matthew 16:22; Mark 8:32). In the thinking of the disciples — as probably all first century Jews — the Messiah was not supposed to be killed by the Romans. Rather, it was His job to lead Israel’s host to overthrow Rome and set up a restored, though much more glorious, Davidic Empire. Shameful and torturous execution at the hands of God’s enemies could not possibly have been part of the plan. Crucifixion for Jesus and the cross for His followers — this was a new teaching, as hard to accept as to understand. Thus, Jesus offered words of encouragement. Some of those standing there would see the kingdom of God (Matthew 16:28; Mark 9:1; Luke 9:27). Though He had spoken of death by the cruel cross, Jesus had not cancelled the kingdom program. Luke emphasizes the connection between Jesus’ cross and resurrection and the transfiguration by introducing the story with “After these sayings,” pointing back to Luke 9:21-27. It was within this context that Jesus took the three disciples closest to Him and led them up a high mountain, which Peter calls the “holy mountain” (2 Peter 1:18), where He was transfigured before them, in part to assure them of the glory to come. Ralph Smith is pastor of Mitaka Evangelical Church. 1. ↑ This may seem overly harsh, and perhaps it is, but I find the relative neglect puzzling to say the least. However, Wright is not alone. A. D. A. Moses observes, “In the West, however, contemporary scholarship has not given the transfiguration story as significant a place in the discussion on New Testament theology as might be expected.” Matthew’s Transfiguration Story and Jewish-Christian Controversy(Sheffield: Sheffield Academic Press, 1996), p. 13.